Perhaps the most popular and beloved U.S. President, Abraham Lincoln is famous for many of his great and historic deeds. As these have been frequently documented, there seems no reason to repeat them here. But few know and realize President Lincoln’s great love for animals. As a boy, Lincoln wrote an essay on the subject as a school exercise that was remembered for years afterward. Later, in a political speech, Lincoln (perhaps remembering these cruel childhood incidents) compared tortured turtles wriggling out of their shells to crooked politicians wriggling out of their skins. Lincoln would preach sermons to his family against cruelty to animals, “contending that an ant’s life was, to it, as sweet as ours”. According to all who knew or met him, Lincoln was a deeply sensitive man. Once, when Lincoln was making a trip with several companions, they came upon a small bird that had been blown out of its nest by a recent wind storm. His companions laughed at him and chided him for delaying them as Lincoln searched the area for the young bird’s home. He was crazy about cats. Recalled one friend, “He would take one and turn it on its back and talk to it for an hour at a time.” Because of this love of cats, Secretary of State William Seward presented President Lincoln with two kittens as a gift early in his administration in August of 1861. In February of 1863, the White House stable caught fire. President Lincoln tried to run into the burning building himself, but was stopped by men on the scene. When he learned that six horses had burned to death in the fire, Lincoln reportedly openly wept. Lincoln had two pet goats he loved, “Nanny” and “Nanko”. He liked to give them free reign to wander (and chew furniture) around the White House, much to the consternation of his staff. He took great pride in the goats’ affection for him. 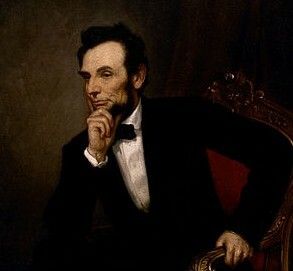 It disputed as to whether Lincoln was actually a vegetarian in his diet. Adherents to the theory of Lincoln’s vegetarianism point to his always-thin physique. His usual breakfast consisted of bread, jam, usually one egg, and coffee. “Old Bob” was a beloved family horse and pulled the Lincoln family carriage. (Lincoln almost never used a hired carriage driver.) After President Lincoln was assassinated in April of 1865, “Old Bob” was prominently in attendance at the funeral. Lincoln is reputedly responsible for the now customary “pardoning of the White House turkey” at Thanksgiving. According to legend though, “Old Jack”, the White House turkey and pet of Lincoln’s son Tad, was actually spared at Christmas.